The apostle James the Elder, more famously known as St-Jacques, has been the subject of a pilgrimage trail since his tomb was apparently discovered in Galicia, northern Spain, in the 9th century. The church of St-Jacques-de-Compostela in Santiago now houses his holy relics. In medieval times it was a major focus of spiritual commitment to make the journey to the shrine from all parts of Europe, with shelter traditionally provided along the way at abbeys and other religious centres. 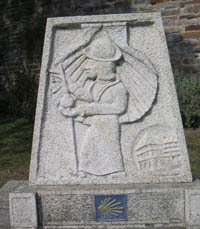 Pilgrims from northern Europe often landed in France and continued their journey by land. The church remains a goal for modern travellers, whether keen walkers or the faithful (or both). An important document, the credencial, is available from Brittany’s official body, the Association Bretonne des Amis de St-Jacques de Compostelle, giving access to special cheap accommodation and other benefits en route. The document is stamped at Spanish locations – essential if you want a certificate on completing the journey (100kms minimum of walking required). In Brittany you can often see St-Jacques portrayed with his fellow-apostles in church porches. He’s the one with the pilgrim’s staff and large hat bearing the scallop shell symbol. These were carried by pilgrims to use as vessels for drinking water or to take home as souvenirs. The shell's pattern of grooves joining at the base is also symbolic, and the modern trail icon is a stylised yellow on blue version, looking more like a sunburst. In Brittany the main points of entry were Le Conquet, St-Pol and Locquirec in Finistere, Paimpol in Cotes d’Armor and Mont St-Michel. 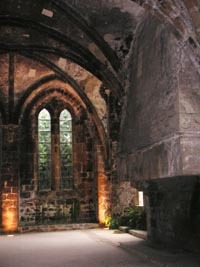 The Abbaye de Beauport at Paimpol still boasts its huge reception room, made necessary by the large numbers of pilgrims disembarking at the port below. Arrivals then made their way south and east, with the three major routes joining at Redon. A memorial on the quay there today records this important staging post for pilgrims, before they continued south via Nantes. If you are interested in walking all or part of these pilgrimage trails in Brittany, the Breton association, who are responsible for the routes, publishes guidebooks with maps and plenty of background information.